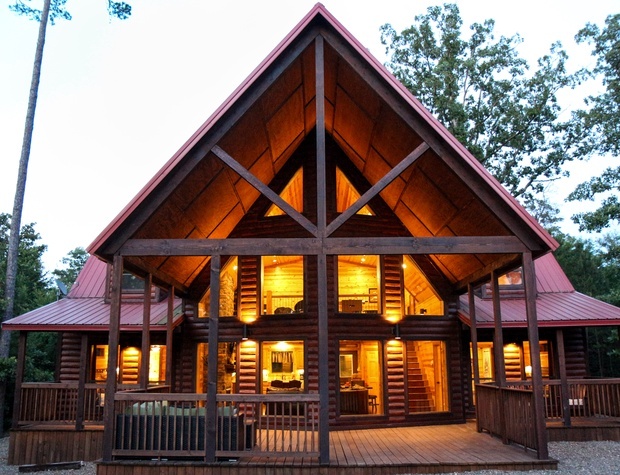 WHITE ROCK RETREAT has 1627 square feet of beautiful cabin living space to entertain your family and friends! Equipped with 2 King Suites downstairs, at WHITE ROCK RETREAT you’ll have plenty of privacy and room to spread out. The Walk-in tile shower in the Master Suite will delight your senses. The second King Suite has a Shower/Tub combo which opens to the hallway for additional access. Additional sleeping arrangements include 1 set of Twin over Queen bunk beds in the spacious loft. The loft foosball table is fun for the whole family and friends in the open loft area. The papasan seating is fun too! Adults and kids alike will enjoy the retro cocktail arcade gaming table. There is a full bath for the upstairs guests as well. WHITE ROCK RETREAT has a fully equipped kitchen with exquisite granite countertops and rich, dark cabinetry. The island bar is perfect for entertaining or simply keeping the Master Chef company while they prepare your delicious meals! WHITE ROCK RETREAT has a very open floor plan so it’s perfect for family gatherings while cooking, watching TV on the flat screen by the fire or enjoying a delicious meal at the dining table. Put your feet up and enjoy the plush leather sectional sofa in front of the gas fireplace. On the back patio you’ll find a cozy hot tub with a gorgeous, young, pine forest for a view!. Kick back in the outdoor gliders around the firepit for some ghost stories and marshmallow roasting or just watch for the deer and other wildlife strolling by. Chill out and loung on the large outdoor sectional while the cozy outdoor fireplace melts away the stresses of everyday. Fire up the gas grill and create the perfect steak dinner after a long day on the lake and dine by fire on the back deck. 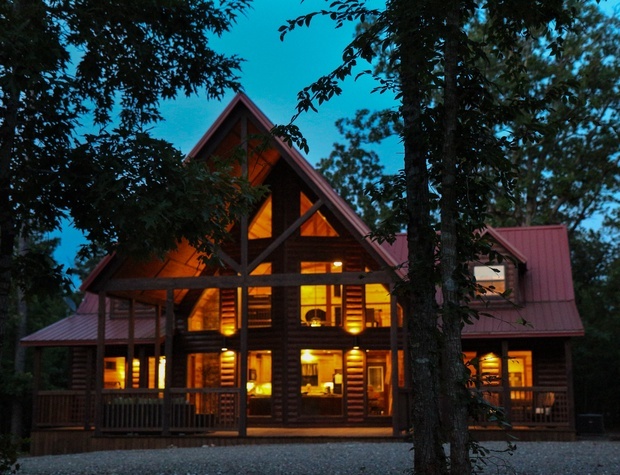 WHITE ROCK RETREAT is family friendly cabin perfect for a nice getaway from the hustle and bustle of city life. The cabin is perfect for two families to share, with each having their privacy. Free Wifi is available a WHITE ROCK RETREAT. Exceeding Maximum Occupancy results in additional charges or cancellation (regardless of guests age) Overcrowding of the cabin is not allowed.